This little angel in the polka-dot dress has a heart that's bigger than any you've ever imagined. Her wings, hat, and halo aren't too bad either! This is an original painting, and not a print. It's created on a 8 x 8 inch canvas board using professional quality acrylic paints. The vintage image has been embellished by hand, and it virtually pops off of the background. 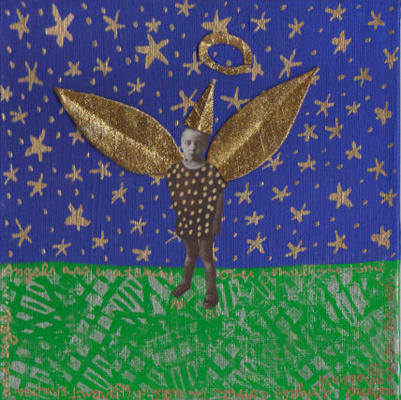 Around the green foreground of this piece, in gold lettering, reads, "Angels are watching over you all the time. You are never alone. Angels come in all different shapes and sizes."